Working with the Bogo People of SW Togo was a rewarding and culturally-rich experience for me (and for them). Read an extract from my book Adventures in Music and Culture below and be inspired! “I find a sheltered mango grove a short walk away and we agree to reconvene there after lunch to record the songs. By the time I get there, the whole area is teeming with people; maybe as many as a hundred. Amazingly, the village folk have agreed that my workshop people can use the traditional barrel drums, and say it is no problem for them. This is quite rare; it can sometimes take years before local non-Christian musicians agree to such a step – or even the Christian ones! This will really enhance the music and also make it something the people of Sassanou will be pleased to hear. 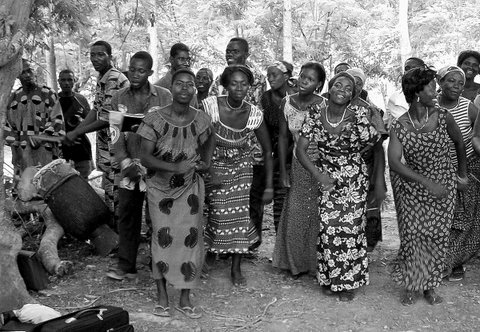 A group of ladies is dancing enthusiastically and singing one of the new songs, as the drums beat out their syncopated accompaniment. It is great to see the joy on everybody’s faces – these people have never worshipped God in their mother tongue until now, and it shows! One lady shouts out: “Jésus nous prend tout!” meaning: ‘Jesus takes everything which is ours’. In other words, even their local music can be used for His glory. Buy your copy here (US) or here (UK).